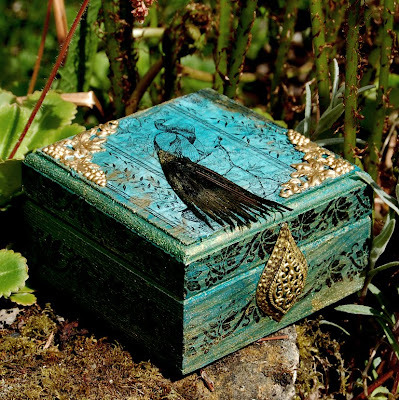 Have you made something artistic with recycled materials lately? Please share your recycled art with us! Post photos online (to your blog, website, etc with a comment and link left on Helga's Blog ) or post them to the wall of our Facebook Fan Page Maximum 3 entries per person. Deadline is May 2. Winners (as picked by Helga and her kitties) will receive goodie bags with our Eco Shrines, Windows and Doors. Little altered mini shrine made using eco shrine and window. 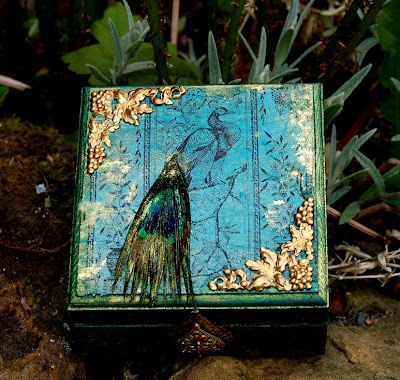 Peacock box. Designed for Crafty Individuals. 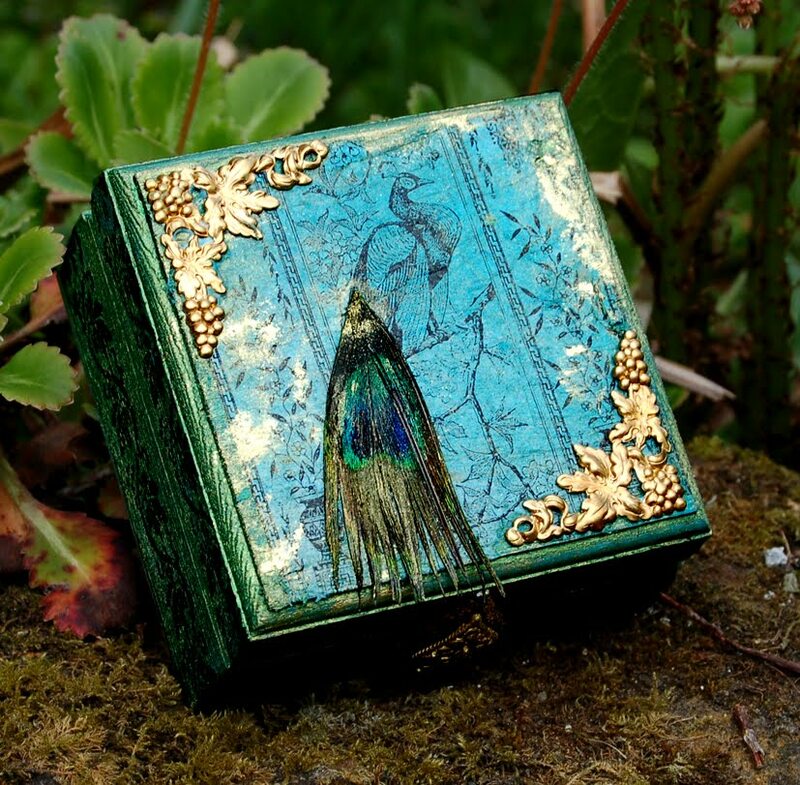 This little wooden box has been stained and stamped using Stamps from Crafty Individuals. The main stamp is plate number CI-310. The border is also by crafty individuals, but as it came in a bag full of little random bits and bobs I dont know what plate it was taken from. The Blank box is from "the Craft Barn"
AndySkinner.org: Its Time! : "The stamps are in the shops, so to celebrate it’s … Competition Time! Andy has a competition on his page to celebrate his new stamps coming out. the prizes are wonderful and all you have to do is guess how many brushes there are in a jar. the stamps are worth taking a look at and he provides stockists in his original post. just click on the link. This little Microscope hanging has been made in the style of Tiffany glass. 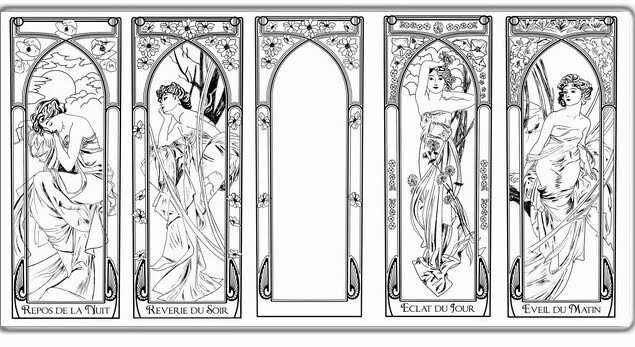 the Art Nouveau ladies of Mucha were ideal for this style. Sadly as its glass and mostly transparent and the sun is shining, a photo didn't come easily. Although to the naked eye the images are clear the camera just wasn't loving it. still, I think you get the idea. 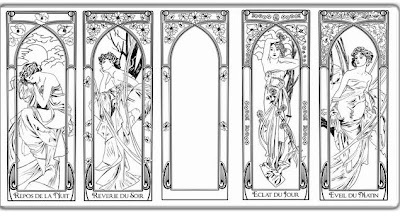 This was designed for Katzelkraft using their Mucha Sheet. 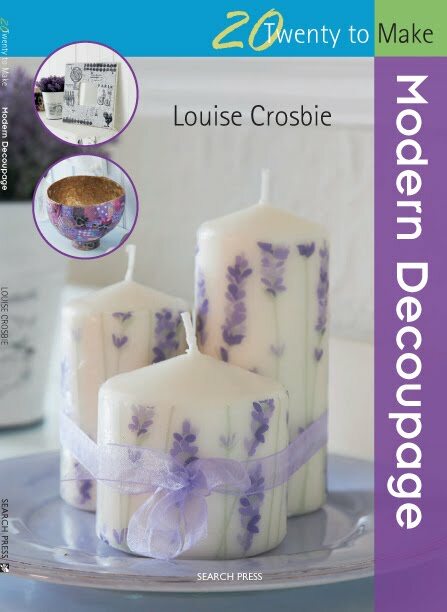 it is available in the UK from the Craft barn HERE. 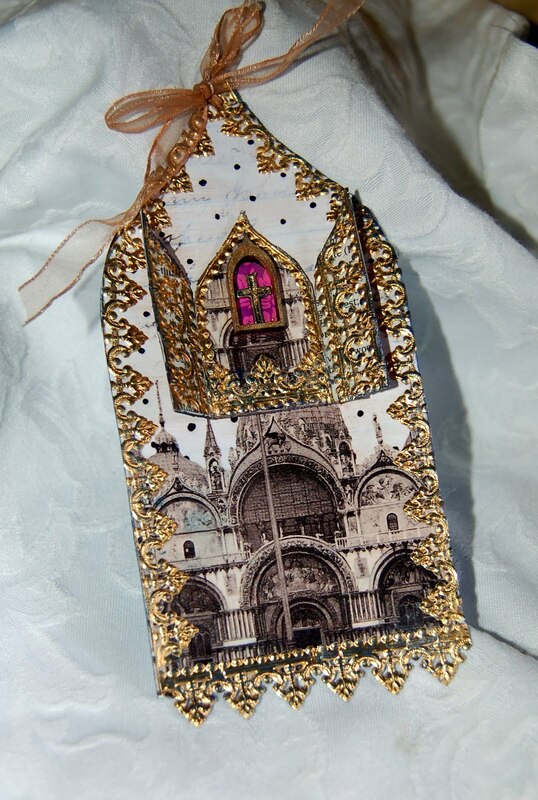 Just so I could use the little shrine on something, I made a tag from the same collage sheet and used the German scrap again to make it coordinate. 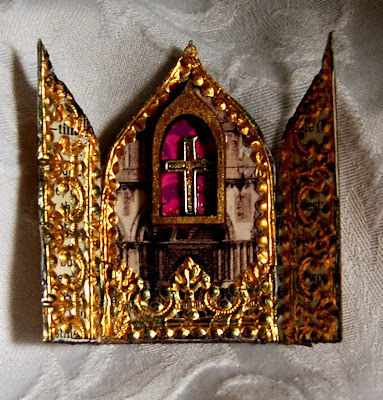 Designed for artchix: mini Easter shrine. Helga at ARTChix Sent a fab little parcel of goodies for me to try out this week. from card shapes like shrines and birds, to wooden shapes and discs. 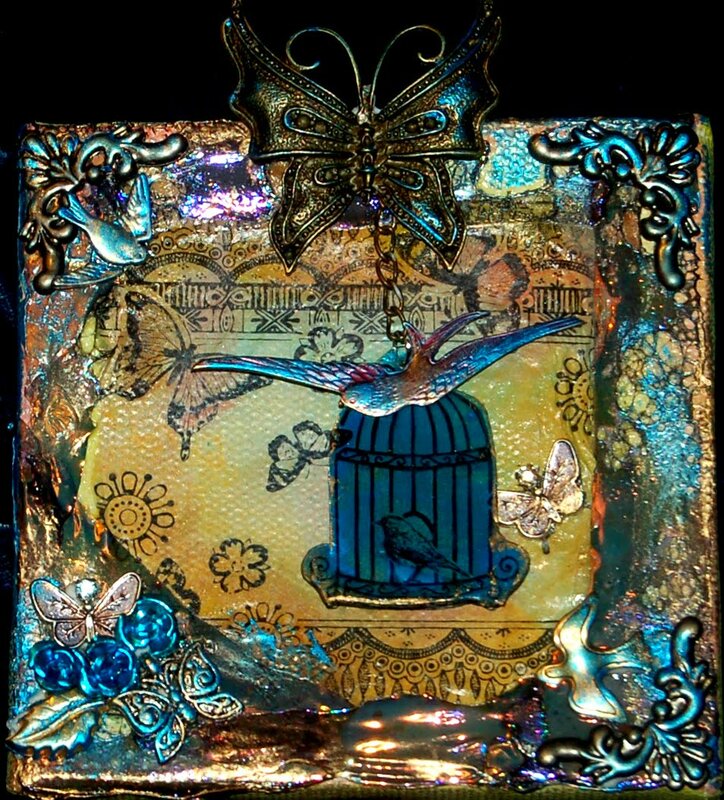 butterflies, flowers, arches, collage sheets. it was an exciting parcel to open. 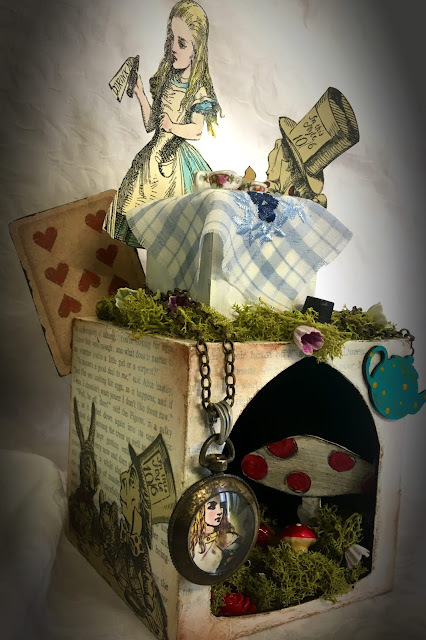 I will be sharing a few of the wonderful items in my Goody bag prize, over at Alter it monthly at the end of the month to my favourite entry. This little Gothic arch shrine is really teeny wee. I haven't been very well so couldn't drag all my inks and beads and charms etc out. 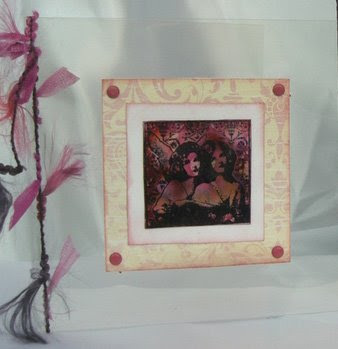 so i sat with my little box of artchix supplies, scissors and glue on a tray and stuck to very simple collage work. 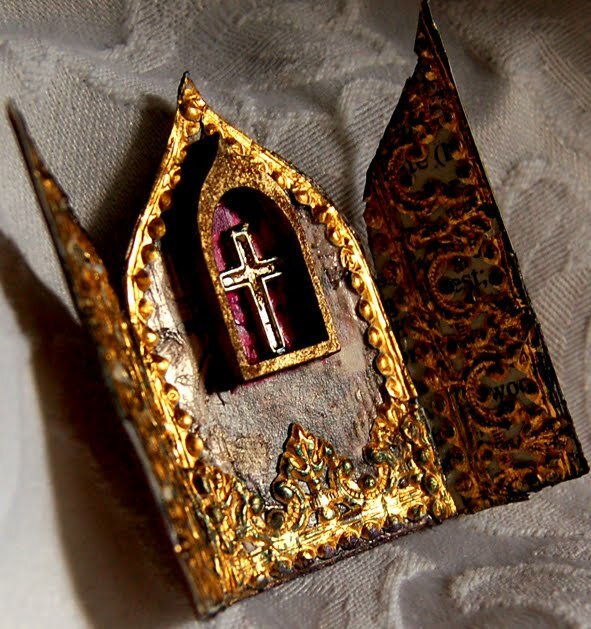 I have used the miniature shrine, some collage images, a little wooden arch window, Dresden /german scrap, and glue. the only thing that I didn't get from artchix was the little Easter cross as I had that kicking around in a tray of mixed beads and charms. 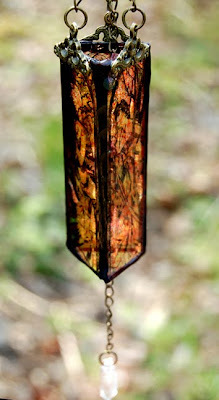 Designed for Crafty Individuals "Simply Square! 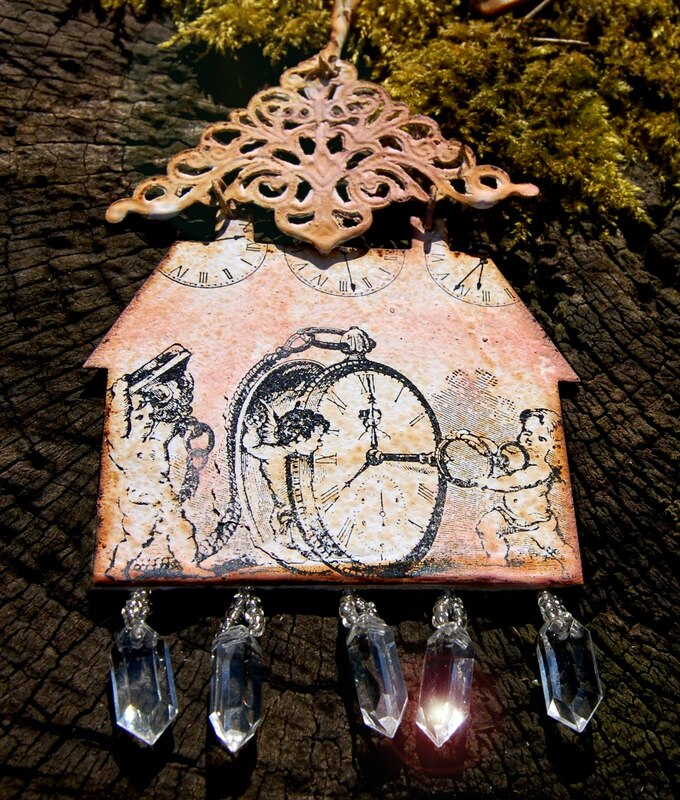 Simply Square is the theme on Crafty Individuals April blog Challenge. Why not nip over and join in? this simple little card is made on acetate. 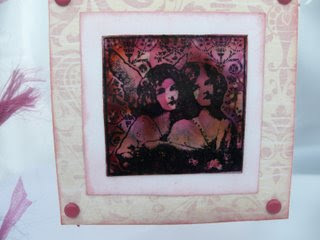 the main image is a piece of acetate coloured with alcohol inks Stamped with one of the beautiful little square angel stamps CI-112. Little quick piece for Katzelkraft. 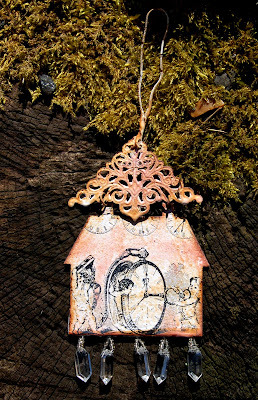 This little house given to me by Gillian has its own natural rusting process. 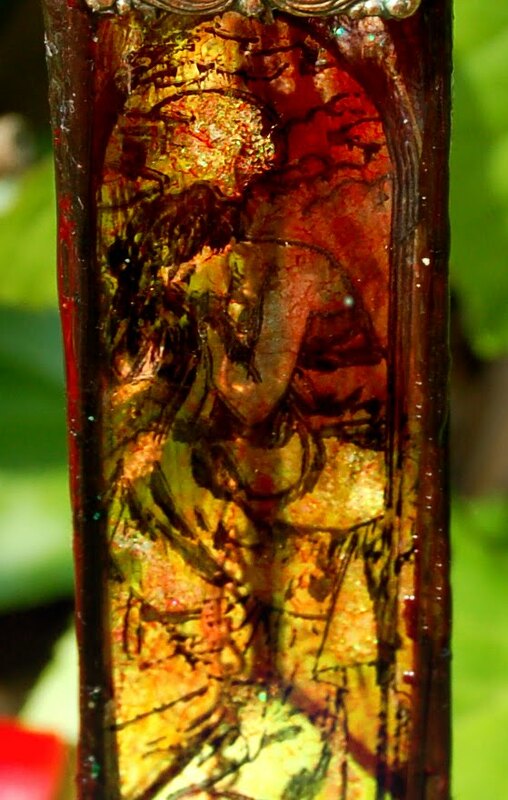 and I've actually seen it alter and get more rusted in the time I have had it. its simply stained and stamped with that lovely little clock cherubs stamp from the Sandglass (hour glass) set. 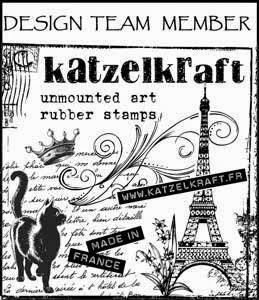 You can get the sheet in the UK HERE along with all the other Katzelcraft stamps from the Craft barn. and Direct from Katzelkraft HERE. 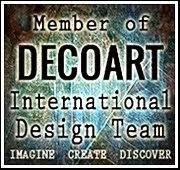 Crafty Individuals have a challenge! Sadly Jean's First email about this, didn't reach me so this is late. On the upside she emailed again to ask if i had the email and if I could makes something anyway. I am too late for the launch but never mind there is still LOADS of time for you all to go join in! So here I am letting you know. fun to be had, challenges to meet and prizes to be won. 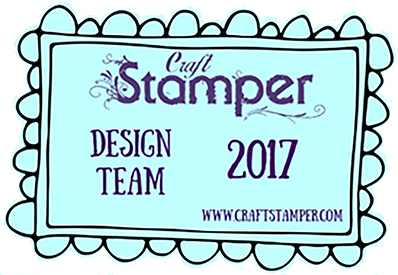 The theme this month is "Simply Square" and all that is required is that you use at least one Crafty individuals product on your piece. 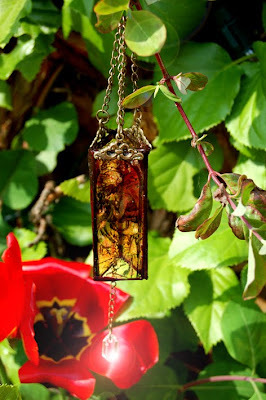 So go on over to the Crafty Individuals Blog and join in. 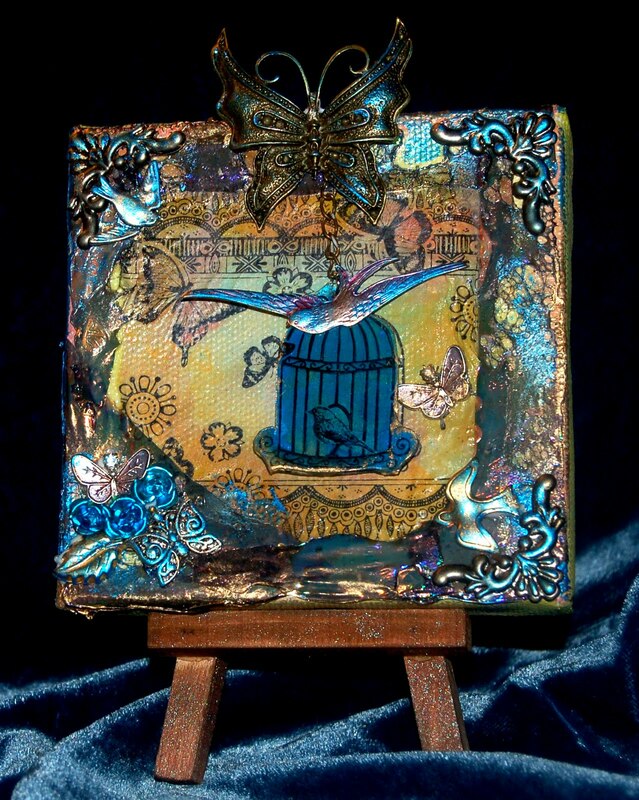 I have used the little square canvas and easel that they have in their shop as well as the lovely bird cage stamp.